We track the issues and threats affecting raptors and take conservation action based on the best available data and scientific research. 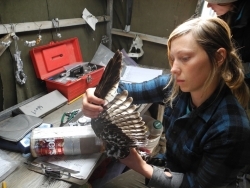 HWI science staff partner with federal and local government agencies, land owners, and other stakeholders to collabroate and develop innovative approaches to protect raptors and our shared environment. Public awareness is an important part of our mission. HWI education staff work to engage the public and build appreciation for the natural world through educational programs and workshops, outdoor field trips, and citizen science volunteer opportunities. We share this planet with many amazing creatures, and all have the responsibility of being good land stewards.